Upon your arrival, you will be driven to Five To Five hotel (budget)/Frame Tree Villag (Mid-range)/Milles Collinese Hotel(luxury) for dinner and overnight. In the morning at 8:00am, you will be picked from the hotel and transfer to Nyungwe Forest NP. Visit the Nyanza palace, Murambi Memorial and Butare Museum enroute. Your lunch will be enroute and continue for dinner and overnight stay at Nyungwe Forest Lodge(Luxury) / Gisakura Guest House(Budget)/Nyungwe Top View lodge(Deluxe). DAY 3: Chimp Tracking and colobus monkey working. Have an early Breakfast and go for briefing at the park headquarters. You will be told the do’s and don’ts while with the chimps before entering the forest. Enjoy them feeding, playing around while taking observations and photographs. In the afternoon, you may go for colobus monkey tracking where you will encounter other primate species as vervet monkeys, blue hoest monkeys among others. Dinner and overnight stay at strong> Nyungwe Forest Lodge(Luxury) / Gisakura Guest House(Budget)/Nyungwe Top View lodge(Deluxe). DAY 4: Canopy and Nature walks. After breakfast, you will go for a canopy walk within the forest expecting to enjoy the beautiful sights and sounds of different bird species such as the Rwenzori Turacos, Hornbills among others. You will also have a self guided walk after lunch around the nearby environment and the Kamiranzovu waterfalls. Dinner and overnight stay at strong> Nyungwe Forest Lodge(Luxury) / Gisakura Guest House(Budget)/Nyungwe Top View lodge(Deluxe). Take breakfast and head to Lake Kivu. Enjoy a breath-taking scenery of the Virunga Mountains and the green vegetation enroute. 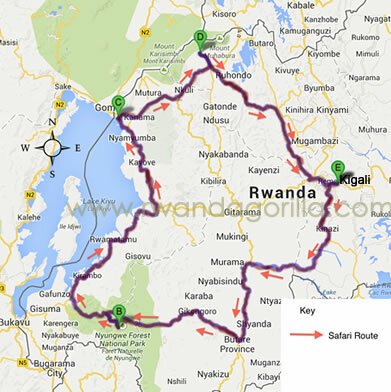 You will have lunch enroute and proceed for either a boat cruise along Lake Kivu or relaxing on the shores. Dinner and overnight at(strong) Water Front Resort(mid-range)/ Paradise Malahide(Deluxe) /Kivu Serena Hotel (Luxury).(/strong). Enjoy your breakfast and drive back to Kigali reaching early for a for a city tour in Kigali where you will visit Nyamata church, local markets, Genocide Museum among others. Later, proceed to the airport to catch up with your scheduled flight back home. You may as well have the above tour in a reverse order or include other activities you want included in the itinerary.